Malta can now finally join in the running for most popular Jewish tourist destination in the Mediterranean now that is has a brand new Kosher restaurant! Malta, a tiny Mediterranean island, is about one tenth the size of Rhode Island and known for its beautiful harbors and walled cities. 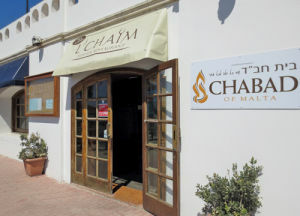 One of the newest Chabads out there, the Chabad of Malta opened just 8 months ago in December 2012 and serves the island’s 100 Jewish year-round residents. Rabbi Segal and his wife, Mushka, opened a new kosher restaurant, L’Chaim, several weeks later. L’Chaim imports Glatt Kosher food from Israel and Belgium and is open from Sunday-Thursday. So far, their most popular menu items are the Israeli schnitzel and french fries. Other main dishes include stir fried chicken with green beans and peppers on crispy sweet potatoes; and the fish of the day. Click here for an article on one American Jew’s experience with the Chabad of Malta.